The first part of August saw the tempest of nature’s wrath. 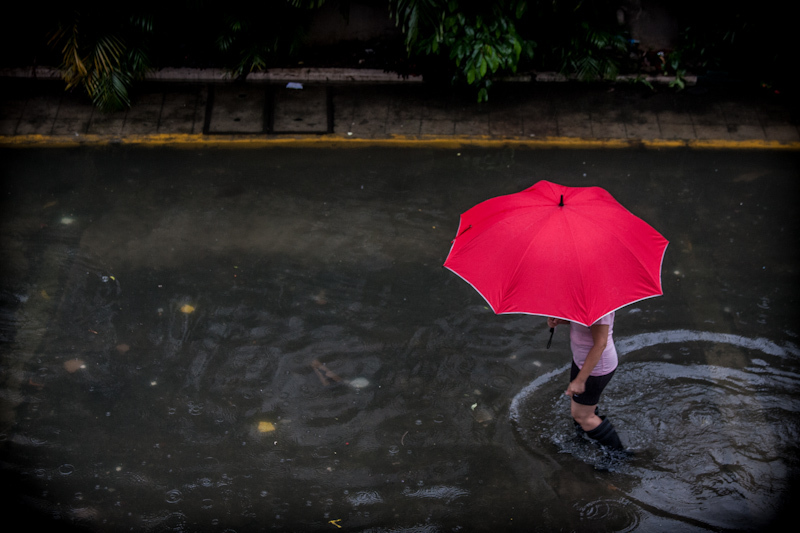 Torrential rains poured unceasingly leaving 80% of Metro Manila underwater. School- and office-operations are affected as students and people cannot leave their homes. Our street is hardly flooded. But I guess we are not lucky this time. Waters rose to knee-deep. Going out is just so inconvenient unless one is willing to wade through the flood waters. As I was observing brave souls wade through murky water in front of the house, an image formed in my mind. The photo attached is exactly what I conceived. I just have to remove a few floatsam to clean up the water a bit. I ask the model to walk back and forth several times while I continue shooting from the second floor window. This continued until I ran out of memory card. I processed in Lightroom 4 to add contrast and improve red and yellow colors.